I had double glasses, but I can secure a simple view thanks to this. The best! This review is about item#39573152. It is a satisfying item. I am concerned that the part of the loupe is rather small. This review is about item#39573161. To be honest, I thought it was a level that I could not use as a loupe. The loupe part is too small, it can not be helped. I think that it is quite different if it is a little bigger. I expected it because it is a 3M item. It is a bit disappointing. I use it as an alternative to regular goggles. Usability is not bad. Cost performance is fairly good. Because the glasses are not parallel, it looks distorted when you put on your glasses. For those with presbyopia, their hands can be enlarged and look good and work progresses. Work in places with differences in light and dark. When it comes to a dark place it makes it difficult to see nearby, but it is handy because you do not have to take out presbyopic glasses one by one. You can see it over a convex lens when you shift it to the top when you need it. It is too big to enter the ordinary glasses case is a difficult point. Please make a cheap case. Although there are many opinions that the magnifying glass part is small, since it is lifted by the dust mask When wearing a mask, you will get in the way a little to see far away. It may be good for your posture with your jaws pulled out. There is not much dissatisfaction in the vision of hand. I cut off the gas with the light-shielding glasses YE-409 on the clip on. 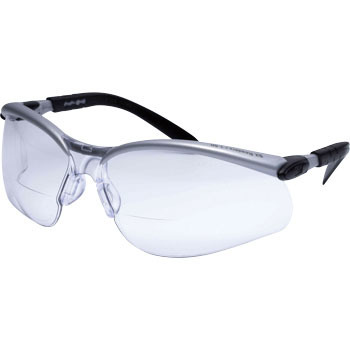 Although YE-409 floats a little, it is comfortable because there is no switching of light shielding glasses, reading glasses, naked eyes. I bought it at the time when many pollen scattered. It was also useful for work outside as it became a pollen eliminator. I tried purchasing it, but the comfort of the magnifying glass is also so so. The scope of the magnifying glass may be a little broader or may it be all over?